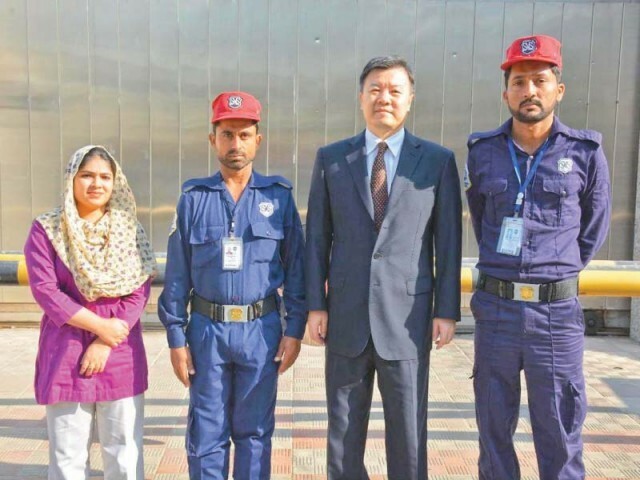 KARACHI: The Chinese Consul General in Karachi, Wang Yu has lauded the performance of Security and Management Services (SMS) guards during the incident on November 23 when three terrorists armed with weapons and explosives attacked the Chinese consulate in Karachi. The Chinese CG, as well as other staff associated with the consulate, expressed gratitude to the three guards and appreciated the SMS for providing them adequate training. CG Wang Yu also handed over a Letter of Appreciation to the guards for their efforts. “In the future, we are confident that all Chinese and Pakistani friends will continue to foster closer relations for the common peace and prosperity of our two countries,” he said. Published in The Express Tribune, December 4th, 2018.